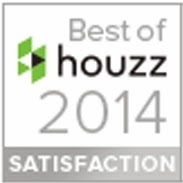 We've been named one of the best design companies of 2014 in the category of "Customer Satisfaction" by Houzz.com! It has been included in a press release as well. Click Here to read the full article. I'm so proud of this achievement and I'm grateful for the wonderful Houzz.com community for voting for me!